Climbers are an extremely useful group of plants in the gardener’s tool bag. They can decieve the eye as to where the garden’s boundaries are and generally soften the garden environment. They provide interest above ground level and help focus one’s attention on the garden rather than fences, sheds and buildings. Actinidia – aka Kiwi. Best known for the multicoloured leaves of kolomitka which does not fruit. I am currently growing male and female deliciosa plants, which has large green almost furry leaves in the hope of getting fruit in a few years time. Sun, fertile, well drained soil, shelter from strong winds, frost hardy. Clematis – There are a huge variety of Clematis available. 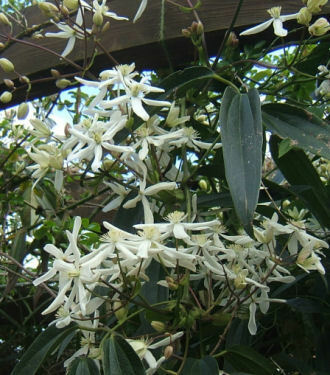 Spring flowering varieties include Alpina and Armandii. There is a wide range for Summer flowering from the big and blousy such as Fireworks to the more delicate, including doubles and some wonderful colours such as florida Sieboldii. In the autumn, there are still varieties of clematis in flower. Even in winter, the cirrhosas are in flower. The key thing about clematis is that their roots should be in shade, but their heads in sun. Virtually any garden will benefit from a variety of clematis. Preferably sun, fertile well drained soil, hardy to frost hardy. 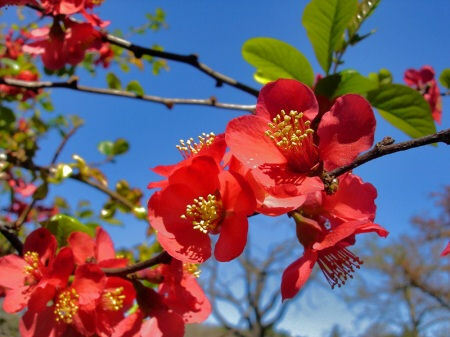 Chaenomeles – It’s amazing how the flowers of the Chaenomeles sprout directly from the stem of the plant in spring, later followed by the foliage. A lovely range of colours from crimson red through pink to white. Sun or partial shade, moderately fertile, well drained soil, hardy. 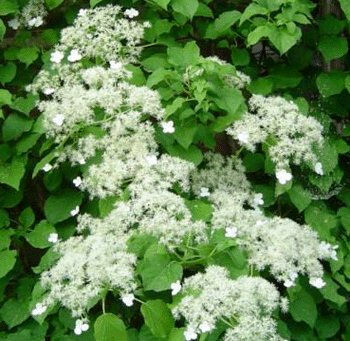 Hydrangea petiolaris – Deciduous wall shrub with white lacecap flowers. Clings using arial roots. I have also tried Hydrangea seemannii which is an evergreen version, however for me it looks very tatty most of the time with last years leaves taking a very long time to drop. 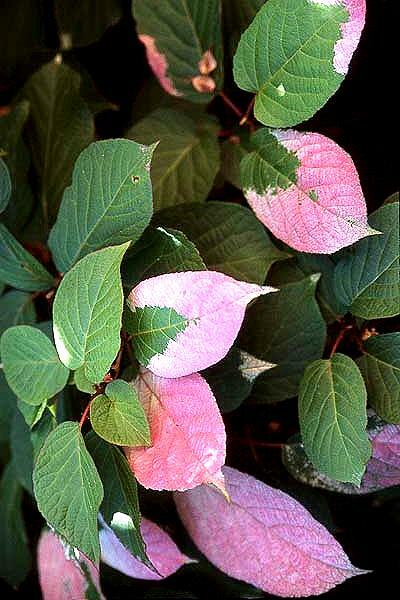 Sun or partial shade, moist but well drained soil, hardy to frost hardy.You might also want to consider fan pruning a shrub hydrangea against a wall. Rosa – Climbing and rambling varieties of the versatile Rose can be trained on fences to bring flowers to eye level. They grow quickly and their flexible stems are very resiliant to canine play. Preferably sun, moist but well drained soil, provide shelter from drying winds, hardy to frost hardy. 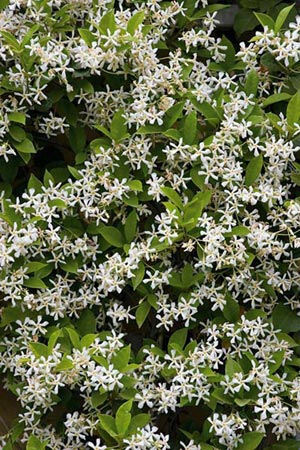 Trachelospermum jasminoides – A beautifully scented climber that winds its tendrils around anything available. 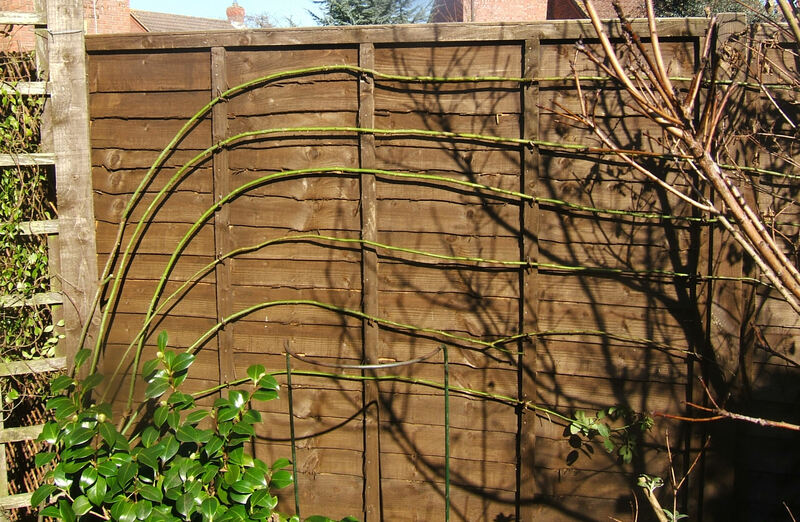 I am growing one up a trellis with the aim of creating a green “window”. From my experience, it is better to buy a younger, smaller plant as these establish more quickly. Sun or partial shade, fertile well drained soil, may need protection from cold drying winds, frost hardy.